UK Prime Minister Tony Blair has called for the reform of the United Nations in a key foreign policy speech in the US. He said the UN secretary general should be given greater powers to improve the organisation's ability to react to international crises. Other institutions such as the World Bank and International Monetary Fund also needed to change, he added in his speech at Georgetown University. A spokesman for Kofi Annan said the UN chief welcomed Mr Blair's proposals. Last month, developing countries of the UN voted to shelve management reforms drawn up by Mr Annan. Iraq was also a key theme of Mr Blair's address, as he repeated his call for more support for the new government there. 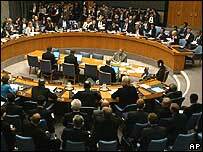 The UK prime minister said the current make-up of the UN Security Council - with no permanent seats for Germany, Japan or India - could no longer be considered legitimate in the modern world. It also needed representation from Latin American and African countries, he said. The IMF and World Bank needed to change - and possibly merge - to enable them to react effectively to economic and humanitarian crises. Mr Blair also called for the creation of a UN environment organisation commensurate with the importance the issue had on the international agenda. He said there was a "hopeless mismatch" between global challenges and the global institutions set up after World War II. 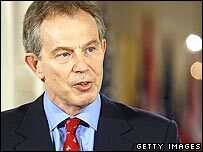 Mr Blair's speech followed a news conference on Thursday in which both he and US President George W Bush acknowledged they had made major mistakes in Iraq. In his address on Friday, the UK leader acknowledged the invasion may have split the international community, but called on it now to support its burgeoning democracy. Mr Blair, who held talks with new Iraqi Prime Minister Nouri Maliki in Baghdad this week, said the new government was "a child of democracy struggling to be born", and that "the international community are the midwives". "You may not agree with the original decision, you may believe mistakes have been made, you may even think how can it be worth the sacrifice, but surely we must all accept this is a genuine attempt to run the race of liberty," he said. said Iran needed to change for the security of the wider world, although he emphasised "I am not saying we should impose change". Mr Blair's address was the third in a series of key foreign policy speeches, but BBC correspondent Nick Childs questions how much weight it will carry, given his weakened political standing. The current White House, despite the close relationship between Mr Bush and Mr Blair, remains wary of getting entangled in what it would see as too much multilateralism, our correspondent adds.